One bite of the seasoned balsamic marinated fillet will leave you wanting more. My husband and I couldn’t get enough of the wonderful hint of sweetness the balsamic vinegar added and the salty earth tones of the seasoning. Not only does this taste like a gourmet meal, but is very easy to make and only takes about 20 – 30 minutes. It comes together quite easily, because you can sauté the mushrooms and spinach while the fillets are resting. Spicewood Food Company Balsamic Vinegar Aged 18 Years is being used and can be purchased on-line. The reason for using Spicewood Food Company Balsamic Vinegar Aged 18 Years is that it is like a balsamic reduction which is sweet and smooth. For a similar dish try Tuscan Seasoned Filets Topped with Sauteed Vegetables in a Garlic Butter Sauce. Ingredient amounts will serve 4. In a large Ziplock bag mix together seasoning, balsamic vinegar and oil. Add fillets, closes and massage marinade to evenly coat fillets. Place the fillets in the refrigerator to marinade for at least 4 hours or overnight if possible. Massage the fillets a couple of times during the process and turn bag to allow all sides of fillets to be evenly coated with the marinade. Heat a grill to a medium high heat. Sear each side of fillet for about 4 – 5 minutes that will normally yield a meat cooked to medium rare. If you prefer your meat medium well cook longer. Doneness of the fillet will depend on the thickness of the fillet and the type of grill you are using. Once grilled to desire doneness, remove, tent with foil and let rest for 10 minutes. While meat is resting, sauté the mushrooms. In a large skillet over medium high heat add olive and mushrooms, sauté until they begin to release their liquid and add shallot and salt and pepper and sauté for about 2 – 3 more minutes. Set aside and sauté spinach by adding olive oil to a large skillet over medium high heat. Add spinach, garlic and seasoning and sauté until wilted about 1 -2 minutes. 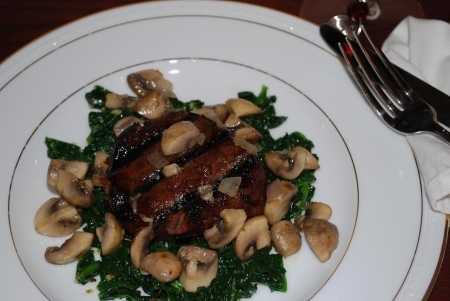 Plate by making a bed of spinach on a plate, add a fillet and top with the sautéed mushrooms. Serve with grated Parmesan cheese or ricotta salata cheese, if desired. Try Conte Di Bregonzo Amarone della Valpocella (Italy), Masi Campofiorin (Italy), Tenuta Sette Ponti Crognolo Toscana (Italy) or Carpineto Farnito (Italy).